Picked fresh from the farm to offer your special recipient a gift blooming with romance and sweet affection, our stunning Hearts in Harmony Mixed Flower Bouquet is a classic romantic gesture that will melt their heart at every turn. 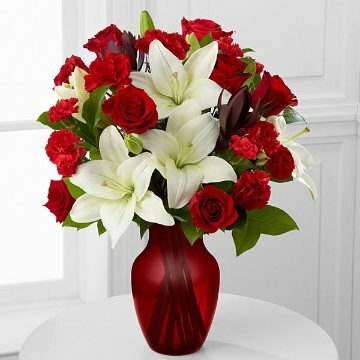 Hand gathered in select floral farms and flaunting the eye-catching combination of red and white, this stunning flower arrangement has been picked fresh for you to help you celebrate a birthday, anniversary, or to convey your heart's true wish. All Florist delivered products and containers may not be exactly as shown. In each case the individual florist may make substitutions of equal or greater value.